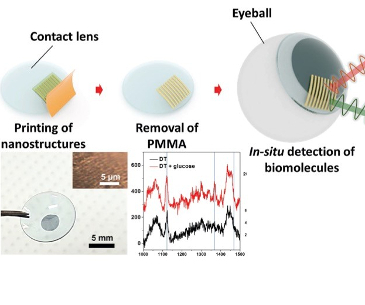 This illustration shows the schematic procedure for the fabrication of a surface-enhanced Raman scattering contact lens via transfer printing. But glucose is a good target for optical sensing, and especially for what is known as surface-enhanced Raman scattering spectroscopy, said Shih, an associate professor of electrical and computer engineering whose lab, the NanoBioPhotonics Group, works on optical biosensing enabled by nanoplasmonics. Surface-enhanced Raman scattering – named for Indian physicist C.V. Raman, who discovered the effect in 1928 – uses information about how light interacts with a material to determine properties of the molecules that make up the material.